Bry-Air … the leaders in plastic drying in Asia and North America since 1978, participated in one of the biggest show of Indian Plastic Industry, PlastIndia 2018. The show was organized at Gandhinagar Ahmedabad, Gujarat from 07th Feb 2018 – 12th Feb 2018. Bry-Air unveiled the advanced models of Gravimetric Blenders (BGD Series) and Moisture Analyzers (Moisture Minder BryScan series) at the show, which attracted a lot of eyeballs and interest of the visitors. 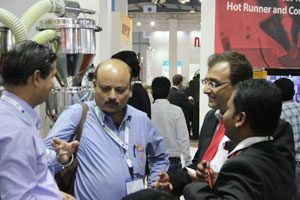 Bry-Air’s Airgineers explained various applications and features of the recently launched advanced models of Gravimetric Blenders and Moisture Minder to all the domestic and international visitors. Other machines which were showcased include dryers, conveying systems, mould dehumidification systems and mould temperature controllers.